It’s a challenge for me to down size my meals now that my kids are older and I’m adapting to new healthy food choices. In fact finding ingredients that are tasty and easy to find. 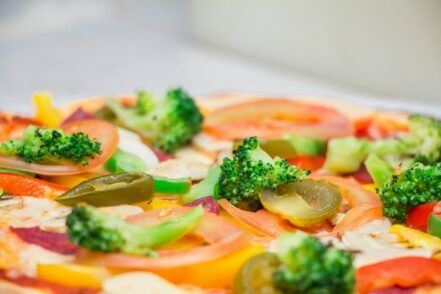 For example it is convenient to pick up a 14″ prepared pizza from a local pizza place it isn’t the best choice when trying to eat healthy. It’s equally important to consider quantity of ingredients. With a few healthy ingredients around the house you can prepare a quick yet satisfying personal version of the traditional take out pizza. In today’s post I share a quick personal three-cheese pepperoni pizza making it easy to keep with healthy choices. It’s easy to keep with your eating goals and feel good about your choices by planning ahead. For example, shopping for products that can be stored in the freezer like the crust featured in this recipe is a great way to start. As a result of keeping nutritious products on hand your meal will have a healthy base further more keeping you on track. Arrange Pizza Crusts on two baking sheets. Spread 1/4 cup pizza sauce on each crust. Top with provolone, pepperoni and mozzarella. Sprinkle with Parmigiano-Reggiano cheese. Bake 8 to 10 minutes, or until crust is golden brown and cheese is melted. For a crispier crust, place pizzas directly on the oven rack. Kontos Pizza Parlor Crust can be found on Amazon.com by clicking here! 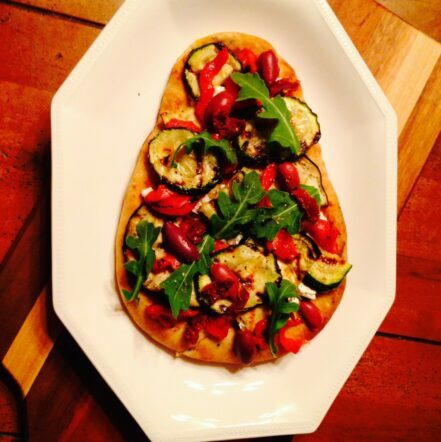 The Kontos brand includes over 50 varieties of flatbread. What I love about the product featured in today’s post is it is 100% vegetarian containing no Trans Fat. There is a Pan Plano which is infused with spicy flavors of Mexico that I would like to try. I had a hard time finding these products at retailers locally. Customers can buy this product featured in today’s post at Amazon.com at Kontos Foods. Check out there social media shares filled with great recipes : Twitter @KontosFoods, Facebook and on Pinterest. Consequently, I’m a huge fan of these easy to create pies. Therefore I have a nice collection of recipes as well as image for you to enjoy. While you click through them I hope you consider printing them for later use. Your opinion is important to me so consider tweeting me! Besides providing a quick solution to help you keep with healthy choices it is equally important to share goals. I’d love to connect with you on this journey. Consider using the comment section on this post so we can connect. I’ll be sure to response and visit your website in return.